So, this past Sunday was the grand finale of sorts for this Twisted Mist Mojito experiment - bottling day. As you can see, the liquid in the carboy cleared up pretty well after eight days. On bottling day, the only real bump was deciding whether or not to add both of the two F-Packs or not. There was very little online in terms of people already solving this problem (and by little, I mean nothing recent and definitive), so I did what the instructions said, and added the multiples of every pack I had when they were needed (just like with the yeast). The two flavour packs were pretty much thick, flavoured corn syrup - at least by the look of it. It was some pretty thick, syrupy stuff that raised the final density / gravity rating to around 1.030. The packs smelled the same (kind of lime/mint/rum although I thought one may have been a bit more "rummy")... and I'd be curious how it would turn out with just one. 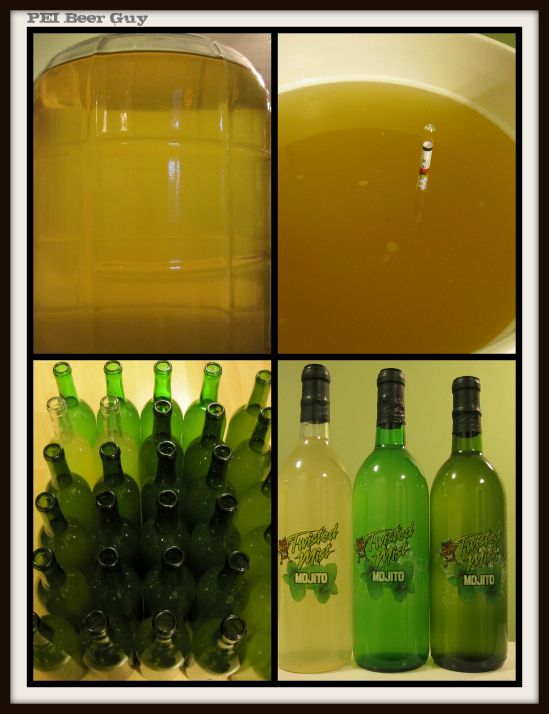 Bottling and corking went pretty smoothly, and I tried it in three different bottle colours, just to see which it looks best in.